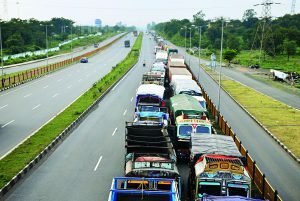 Traffic cops divert Trucks trying to enter Calcutta back to Kona Expressway from the Vidyasagar Setu toll plaza around 10am on Thursday. Entry for heavy goods vehicles was barred after 6am. Cause: Goods vehicles had been barred from entering the city after the Majerhat bridge collapsed on Tuesday. The restriction was partially lifted on Wednesday, allowing entry between 11pm and 6am. Effect: A long queue of trucks had formed by 4am on Thursday, the line stretching 3km beyond the toll plaza. The snarl took more than six hours to ease. Calcutta: Chief minister Mamata Banerjee on Thursday banished heavy goods vehicles from the city to “protect” its roads, bridges and flyovers, leaving it to the port trust and other agencies to make “alternative arrangements” so that trade and transportation does not suffer. “I do not want heavy trucks of 20 wheels to ply on city roads. Port and others have to make alternative arrangements,” she said after a meeting to review the state of bridges and flyovers in Bengal, three of which have collapsed in five years. Asked whether only 20-wheel trailers were barred from entering the city, the chief minister expanded the scope of the ban to “10 to 20-wheel trucks”. 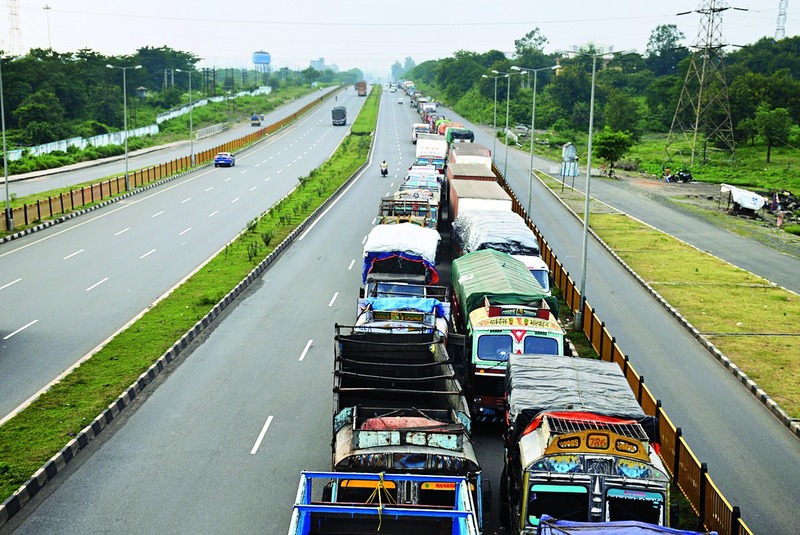 The decision to protect Calcutta’s battered roads and wobbly bridges from heavy goods vehicles could have severe repercussions on trade unless large and adequate number of warehouses are built along the highways. Around 3,500-4,000 loaded trucks leave Calcutta every day, carrying ready-made garments, plastic goods, tea and vegetables to states like Maharashtra, Gujarat, Uttar Pradesh and Karnataka. An even larger number of goods vehicles bring medicines, pulses, soya oil, mustard oil, fruits, fishes, eggs, cloth, tiles and granite blocks to the city. Burrabazar, eastern India’s biggest trading hub, alone receives between 1,600 and 1,800 tonnes of goods each day. Wholesale markets in Sealdah, the fish markets in Howrah and Patipukur and the fruit hub in Mechhua are part of this traffic network. A ban on 10 to 20-wheel trucks entering the city translates into a logistics nightmare, not to speak of extra costs in the form of transportation of goods by smaller vehicles from the outskirts. “The additional cost of offloading and moving goods on Matadors and vans will be passed on to wholesale and retail buyers,” a transporter said. Truck owners have welcomed the government’s decision, subject to alternative arrangements being made. “We are all for it. But in that case, the warehouses must be moved out of Calcutta to along the highways,” said a member of the Calcutta Goods Transport Association (CGTA). A truck terminal near Dankuni has been in the making for nearly three decades. The CGTA had acquired 146 acres along Delhi Road for the hub but truck owners are reluctant to pay a registration fee for individual plots to be sub-leased. “We paid a registration fee while purchasing the land, then again while getting a lease. It is difficult to pay a registration fee for the third time for sub-leasing,” a CGTA official said. Chief minister Mamata on Thursday asked the administration to prevent overloading to reduce damage to roads. But recent rule changes by the Union ministry of road transport and highways might make that hard to achieve. According to a notification, axle load or the load-bearing capacity of trucks has been raised by 20 to 25 per cent. This will enable trucks to officially carry more load across the country. The ministry headed by Nitin Gadkari has defended the move, saying that the load-bearing capacity of roads and bridges has gone up since 1983, when the axle load of goods vehicles had been previously revised. Operations within the Calcutta Dock System in Kidderpore will also be severely impacted by the ban on heavy goods vehicles. Container movement depends mainly on large trucks with 10 to 20 wheels. The port is already feeling the pinch of traffic restrictions imposed on 12 roads around that area. Sources in the Calcutta Port Trust said goods traffic was down by 40 per cent to around 900 on Thursday against an average of 1,500. According to a preliminary estimate, around 200 trucks with more than 20 wheels visit the port every day. In the rest of Calcutta, 10-wheel trucks are more common and 7,000 to 8000 of them criss-cross the city and the adjoining districts.